KANUNGU– President Yoweri Museveni has ordered all wetland encroachers across the country to vacate with immediate effect. Museveni issued the directive as he presided over the groundbreaking ceremony for the construction of the Kanungu-Rukungiri road in the Kigezi Sub-Region on Friday afternoon. He rushed to the area following wild spread cries of starvation in the district resulting from the prolonged dry spell. Several families in Kihihi, Nyamirama, Nyakinoni and Nyanga Sub Counties have been hit hard by the food crisis. Last year at least fifteen people were said to have died in the district due to starvation. The food crisis forced several families to resort to spear grass leaves and roots for survival from the dry spell. As a result, Museveni wants all wetland encroachers to vacate immediately. He explains that 40 percent of the rains in Uganda come from Swamps, most of which, have been drained by encroachers for cultivation and settlement. Mr Museveni added the dry spell affected Kanungu is due to changes in weather which result from people residing and working around swamps and wetlands. “Recently drought affected this area, largely due to patterns. These changes, however, were as a result of human activity,” he stressed. Mr. Museveni said that the newly built water supply for Kanungu district and neighboring areas will get water supply from the wetlands. At the same event, Museveni also launched the construction of Shs 78.5 kilometre project that he said is expected to be built within 3 years at a total of Shs207.8 billion. 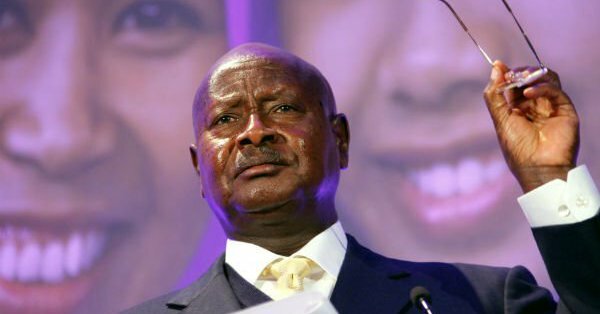 Museveni said that the NRM Government has pioneered and registered great success in the construction of several roads in Uganda since 1986 when the Movement took over political power. He also promised to support the K16 Girls Network which is involved in promoting the education of the girl child in Kanungu district.